DMF International manufactures and supplies climate control swing doors through a large network of agents across Australia and SE Asia. DMF climate control swing doors include PVC Swingflex Mk5 and Mk6 swing doors, Impact doors and Visiflex strip curtains. Swingflex and Impact doors are ideal for supermarkets, retail stores, commercial kitchens, processing areas and high level clinical production areas. Quiet in operation, DMF Swingflex and Impact doors are custom made to the required size (up to 3000H x 3000W) with special conditions for doors over three metres. 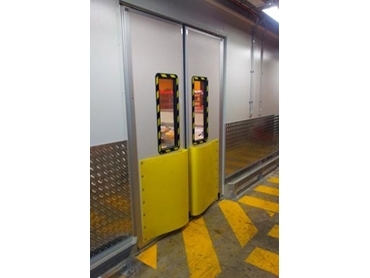 Flexible PVC impact doors are ideal for protecting busy working environments from dust, noise and temperature. Suitable for pedestrian traffic and trolleys, they also come in a heavy duty model for forklift traffic.